This is an evergreen compact shrub with stiff blue green leaves. Works well as an accent plant. Don’t expect blooms for many years. When it does bloom, the original rosette will die, leaving some new “pups” to carry on. This is an evergreen shrub with bluish-green spike like leaves. 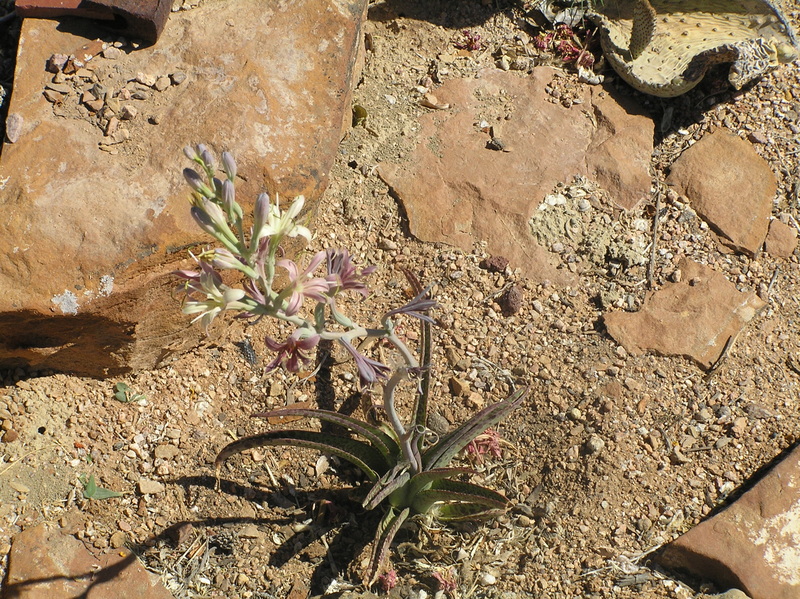 It is sometimes listed as a subspecies of Parry’s Agave. This tall shrub has white flowers in the spring followed by sweet blue purple berries in the fall. The berries are loved by birds and great for jams. The fruit taste super sweet after a hard frost. This tall shrub has white fragrant flowers in the spring followed by bluish black berries. The leaves have a blue green hue. Great for birds and extremely drought tolerant. This is a medium sized shrub with delicate lacy leaves and purple flowers with orange anthers in late summer. Be forewarned it is the last plant to leaf out in the spring. This beautiful plant is native throughout the plains states. This is a graceful compact shrub with delicate green fern like leaves and fragrant pink flowers with orange anthers. They bloom in late spring to early summer. Like its relative A. canescens it is also late to leaf out in the spring. This is a low growing cascading evergreen shrub with dark glossy green leaves and tiny pink flowers in early spring. It has very attractive cinnamon-red bark color. They prefer well drainage neutral to acidic soils. This an upright form of Manzanita it is a broad leaf evergreen shrub with very attractive cinnamon red to purple bark. They have white to pink flowers in late winter. They prefer well drained neutral to acidic soils. This is a low growing evergreen shrub with glossy green leaves and small pink flowers in early spring. It has a very attractive red bark color. They prefer well drained neutral to acidic soils. This is a dense rounded evergreen with cinnamon-red to purplish exfoliating bark. Pinkish white flowers in April to May, followed by small red berries in fall. This is a medium sized bushy shrub with fragrant silver finely cut foliage. It works well as an accent plant. This is a medium sized mounding evergreen shrub with brilliant silver foliage. Silver Sage is one of the predominant sage brush species on the Grand Mesa. This is a silver grey evergreen shrub with thread like leaves. They have great texture! They tolerate clay soils better than the name suggests. They can be found in the wild near Moab, Utah. This is a tall fragrant shrub with rugged silver foliage. It is a great accent plant and excellent for wildlife habitat. It is extremely drought tolerant and soil tolerant. This is a uniformly flat-topped shrub with silver leaves. It performs well at elevations of 6,000 to 10,000′ and provides valuable cover for wildlife. This is a low growing shrub with lacey silver foliage. It works well as an accent plant. This is a large mounding shrub with silver green leaves and tan four winged seeds on the female plants. It tolerates saline soils very well and is great for attracting wildlife. Works well as a transitional plant, going from a landscape and transitioning into the wild. This is a mounding evergreen shrub with silver green leaves. They have tan to pink seeds on the female plants in late fall. They are great for winter color! They tolerate saline soils very well. This is a low growing shrub with silver green leaves. 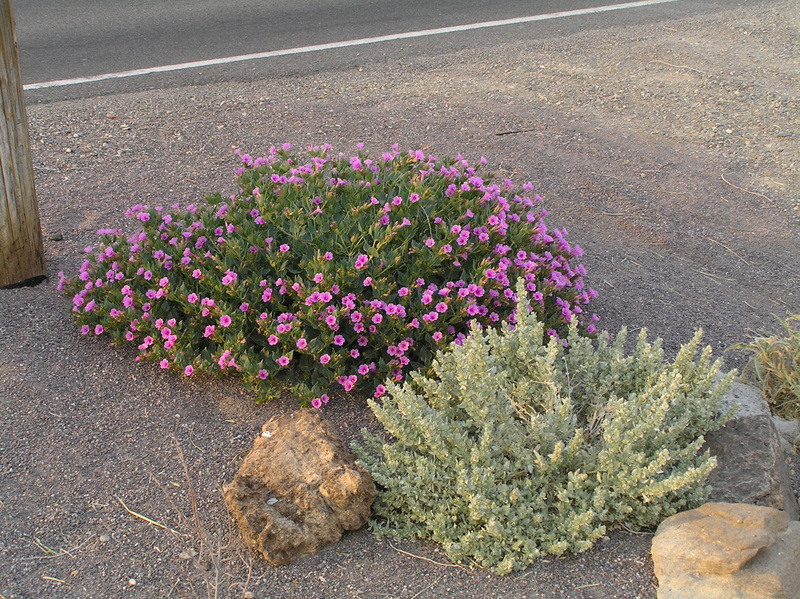 It is excellent as a ground cover in extremely arid conditions. It tolerates saline soils and makes a great bonsai. This is a mound forming evergreen shrub with silver green leaves. It tolerates poor soils and provides excellent forage for wildlife. This is a vase-shaped mounding shrub with silver blue gray leaves. This shrub has lilac flowers in June on previous year’s wood. It is great for attracting butterflies. This is a large mounding shrub with deep purple fragrant flowers in summer to fall. 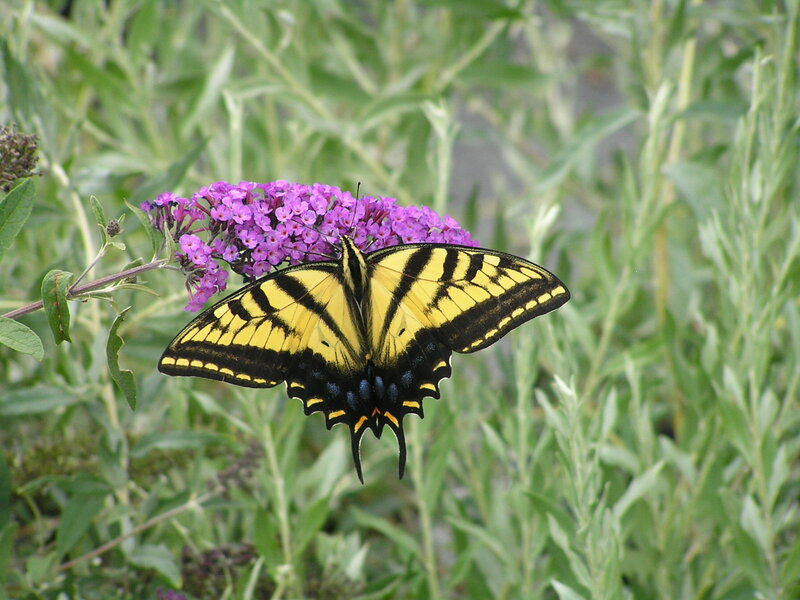 This shrub is great for attracting butterflies and humming birds. This is a mounding medium sized vase-shaped shrub with dark green leave. 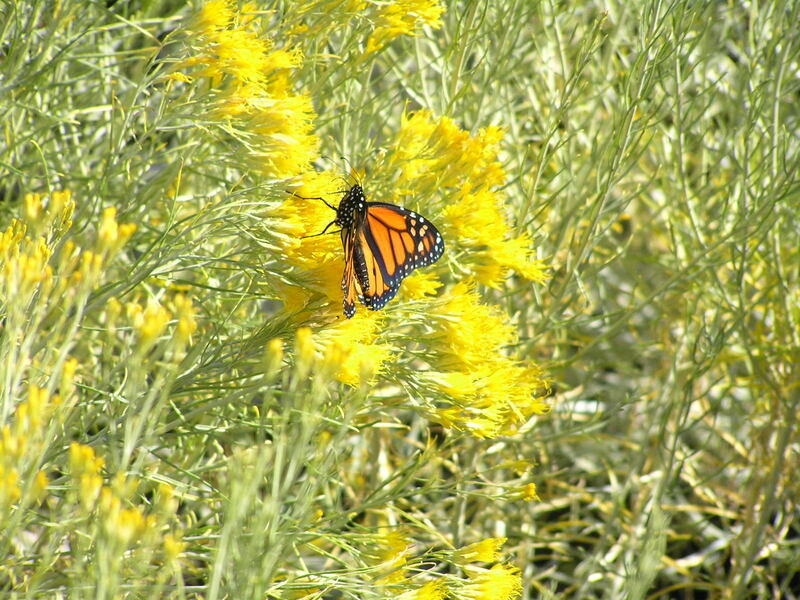 It makes a great cut flower and is good for attracting butterflies. This is a mounding medium sized shrub with magenta purple flowers. They make a great fragrant dried flower. This is a vase-shaped mounding shrub with bright green leaves and fragrant pink flower that bloom until frost. It is great for attracting butterflies. This is a tall vase-shaped shrub with white fragrant flowers in summer. It makes a good cut flower. This is a tall up right shrub with dark red fragrant flowers. Works well as a cut flower. This is a large mounding shrub with bright green leaves and honey yellow flowers all summer long. Works well as a cut flower and smells really good! This is a dense shrub with narrow grayish green leaves. It has brilliant blue flowers in mid to late summer and is great for bees. This is an upright shrub with dark green leaves and dark blue flowers. It works well as a cut flower. This is an upright arching shrub with striking silver foliage and fluffy white seeds in winter. It provides excellent forage for wildlife. It has great winter color. This is an intricately branched evergreen shrub with tiny purple flowers in early spring followed by fluffy white twisting seeds in summer. They make a good evergreen screen and the birds love to hide in them. This is a tall evergreen shrub or tree which can be pruned into tree form. It is excellent as a tall evergreen screen and is great for wildlife. This is a medium sized deciduous shrub with deeply ridged green leaves and purple bark in winter. It has white twisting seeds that reflect sunlight in summer. The dried leaves make a great potpourri. This is a tall semi evergreen shrub with fragrant fern like leaves. They produce creamy white flowers in late summer. Plant them near a window to enjoy the fragrance. This is a small tree or large shrub with bright green leaves and pink orchid like flowers. It works well for attracting humming birds. We carry a nice pink form, as well as a burgundy one. This is a bushy semi evergreen shrub with thin blue or green leaves. They have bright yellow flowers in late summer to fall followed by fluffy white seeds. This works well as a transitional plant going from an irrigated landscape into the wild. This is a bushy semi evergreen shrub with thin green leaves and bright yellow flowers in fall. They are very drought tolerant and can tolerate poor soils. The Rabbitbrushs work well in reclamation projects because they can reseed easily. This is a dwarf rounded shrub with thin blue to green foliage. They produce bright yellow flowers in late summer to fall. They are great for fall and winter color. Their compact form makes them ideal for small gardens. This is a low growing mounding shrub with thin twisting leaves and bright yellow flowers in late summer. Not currently available. This is a dense upright shrub with medium green foliage. It has creamy white flowers in May followed by white fruit in fall. They have showy red to burgundy stems during winter. This is a dense low growing dogwood with bright red stems in winter. This shrub has dark purple fall color. This is a rounded spreading shrub with red stems and bright green leaves. This shrub has white flowers in spring followed by white berries in summer. 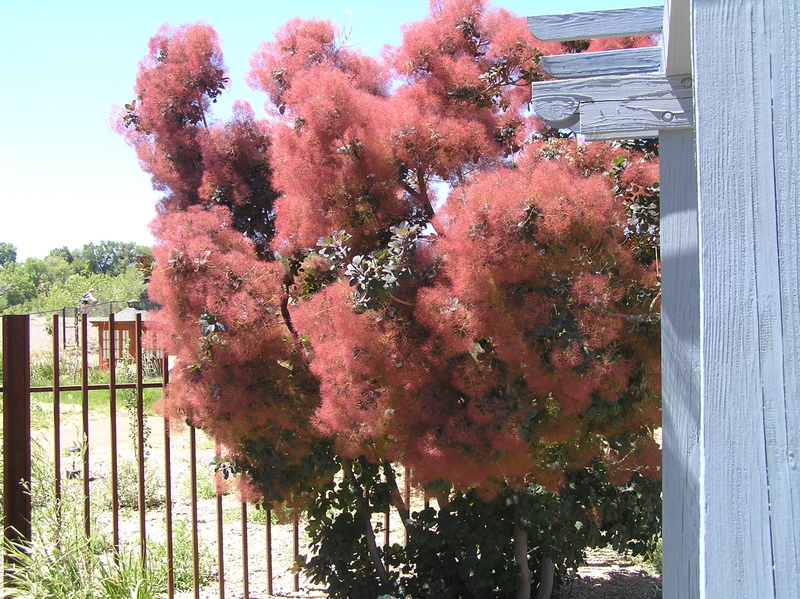 This is a tall shrub with rich dark purple leaves and cottony purple seed that resemble smoke. Tolerates deer, drought and clay soils. Makes a great accent plant. This is a low mounding shrub with small glossy green leaves. 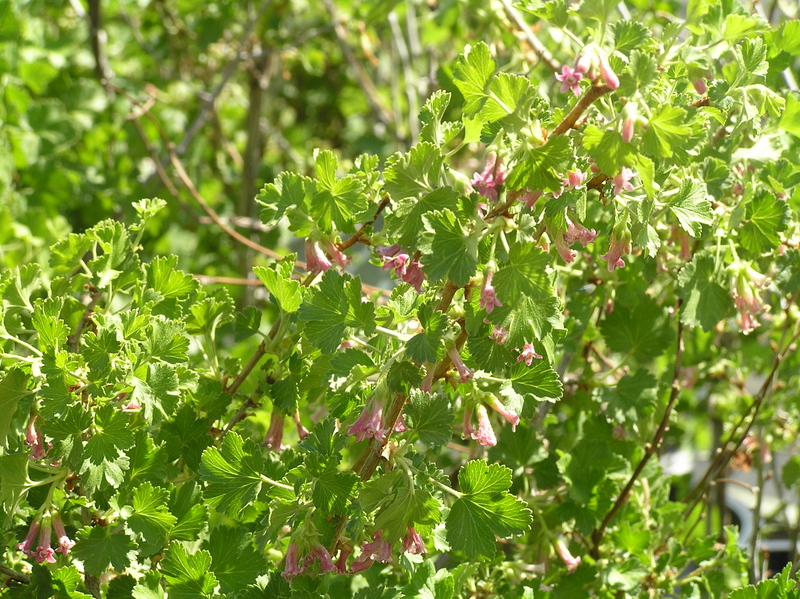 They have pale pink small flowers in June and large red berries in late summer. 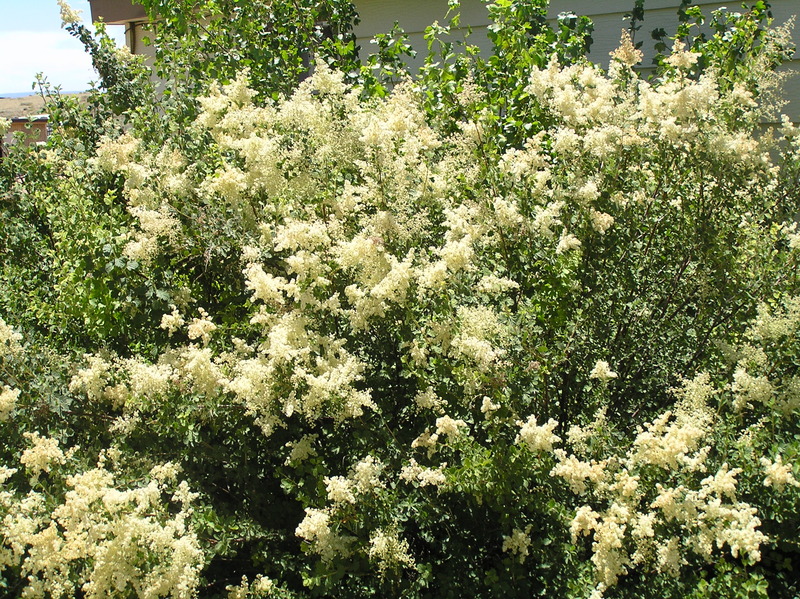 This is a semi evergreen upright mounding shrub with dark green leaves and fragrant cream colored flowers in summer. The twigs and leaves are used to make a gold dye. It is extremely drought tolerant. 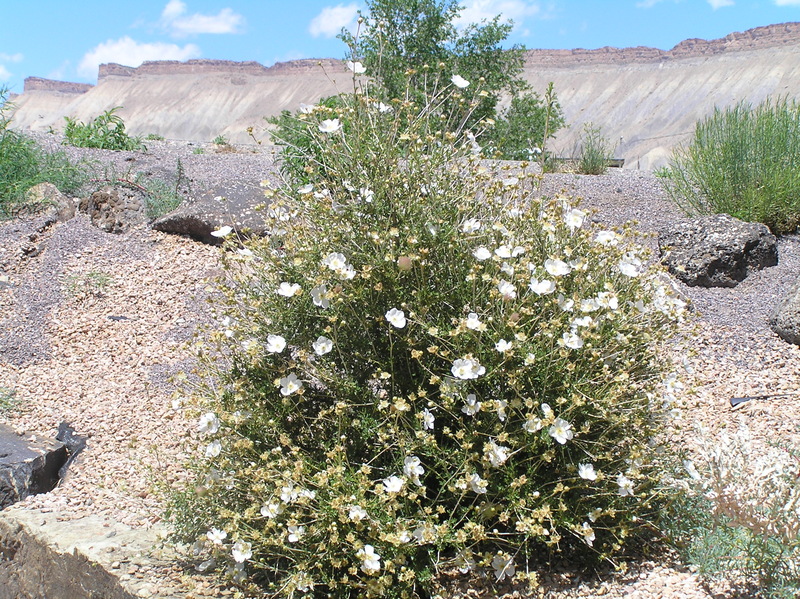 I have had the pleasure to be in the desert when the Cliff Rose were in full bloom, the fragrance is enchanting! It is difficult to produce in the nursery, so supplies are limited. This is an evergreen yucca like shrub with thin dark green leaves. Works well in a cactus gardens. Spiked leaves are sharply toothed, so be careful. Discontinued due to lack of hardiness. This is a mounding evergreen shrub with slender blue stems. The female plants have bright red berries in midsummer. They have a tendency to sucker. This is a low growing, mat forming evergreen shrub. It has dense dark green stems, and the females have red berries. Torrey’s Ephedra is a mounding evergreen shrub with blue green stems. They have yellow flowers in the spring and the female produce papery seeds in summer. They prefer poor soils and are drought tolerant. This is a mounding evergreen shrub with green broom like branches. They produce bright yellow flowers in early spring. It makes a great tea which may have health benefits such as relieve from allergies and colds. It tolerates poor soils and are drought tolerant. This is an extremely durable clump forming shrub with wooly green leaves and white flowers change to pink and red after freezing. This is a great plant for fall and winter color. Song birds love the seeds! This is an upright mounding evergreen shrub with small green leaves and white bark. The flowers are bright white and bloom all summer long. The flowers are followed by feathery pink to white seed heads. This is an upright airy shrub with small glossy leaves and fragrant four-petaled white flowers in June. It has reddish bark exfoliates to gray as it matures. This is a tall shrub with delicate green leaves and light blue bark. The female plants are covered in bright blue berries in late summer. They are great for wildlife. This is a tall rounded shrub with bright yellow flowers in early spring. Meadowlark is the hardiest cultivar introduced by North Dakota State University. It prefers full sun for the best blooms. This is a fall blooming sub- shrub with bright golden yellow flowers. It grows in our driest deserts. 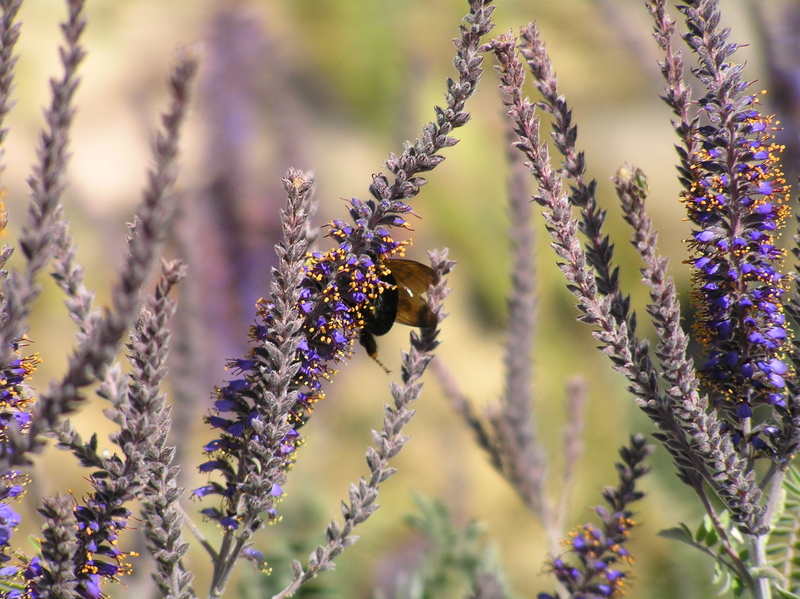 The dried leaves and flowers can be used as a poultice to relieve bees stings and joint pain. This is a clump forming shrub with long arching spike like dark green leaves. They produce striking red flower spikes up to 7′ tall which persist much of the summer. The hummingbirds love them. This is a gracefully arching mounding shrub with bright green leaves and sprays of cream white to pink fragrant flowers. Thrives in rocky areas. This is a small upright shrub with course green leaves, whitish underneath. It has clusters of dainty white flowers in late May. They prefer dry well drained soils. They tolerate shade well. This is a tall evergreen shrub with blue green holly like leaves. It has fragrant brilliant yellow flowers in early spring followed by persistent rose fruits in summer. The fruits make a great jams and jelly. I mix the Fremont fruit with raspberry juice to make a lovely jelly. They are drought tolerant. This is a small Agave like shrub with spotted leaves and slender flower stalks with fragrant creamy white flowers in mid summer. Drought tolerant and prefers well drained soils. Our Spice Lily has survived several harsh winters in our cactus garden. This is a grass like shrub with leathery green leaves with finely toothed margins. They have greenish white flowers clustered along 4-5′ stalks in early summer. This is an upright arching shrub with bright glossy green leaves and fragrant white flowers in early summer. They have yellow – red fruits in late summer to fall. This is an upright shrub with silver foliage and deep blue flowers in summer to fall. The bees love them. This is a broad rounded shrub with fragrant white flowers in June, the flowers are good for attracting butterflies. This is a selection from the Cheyenne USDA Experimental Station. This is a splendid upright shrub with small glossy green leaves, delicate reddish brown branches and small fragrant white flowers in June. The flowers smell like Juicy Fruit Gum! They are extremely drought tolerant. This is a small shrub with glossy green leaves and white flower clusters in summer. They have multicolored bark throughout the year. They have great fall color. They prefer dry shade growing conditions. This is a rounded shrub with blue green foliage and large pure white flowers. This is a fine textured, compact rounded shrub. Abundant small bright yellow flowers from June to August. This is an upright shrub with dark green leaves and gold flowers. This is an upright shrub with large dark green leaves and bright golden yellow flowers throughout the summer. This is a large spreading shrub with gray green foliage and pale yellow flowers in summer. This is an upright compact shrub with bright glossy green leaves and bright white flowers. This is a pink flowering selection made by the University of Manitoba, Canada. The flower color will fade to white in extremely hot weather. This is a rounded upright shrub with blue green leaves. They have fragrant white flowers in early spring followed by blue black berries in summer. It is great for the birds and has excellent fall color. This is a low growing section of P. besseyi that was found in the Pawnee National Grasslands, in Weld County, Colorado. They have blue green leaves and white flowers in the spring. They have great fall color. This shrub has abundant small pink flowers which precede purple foliage in late April. The foliage stays purple all summer long. This is a large upright shrub or small clump forming tree with glossy green leaves and white flowers in spring. They produce dark blue to red fruit in late summer. The birds love it. They have yellow to red fall color. This is an elegant rounded tree with clusters of white flowers followed purple red berries. The leaves emerge bright green then turn purple as they mature. It tends to sucker, so it is easier to grow as a clump form. 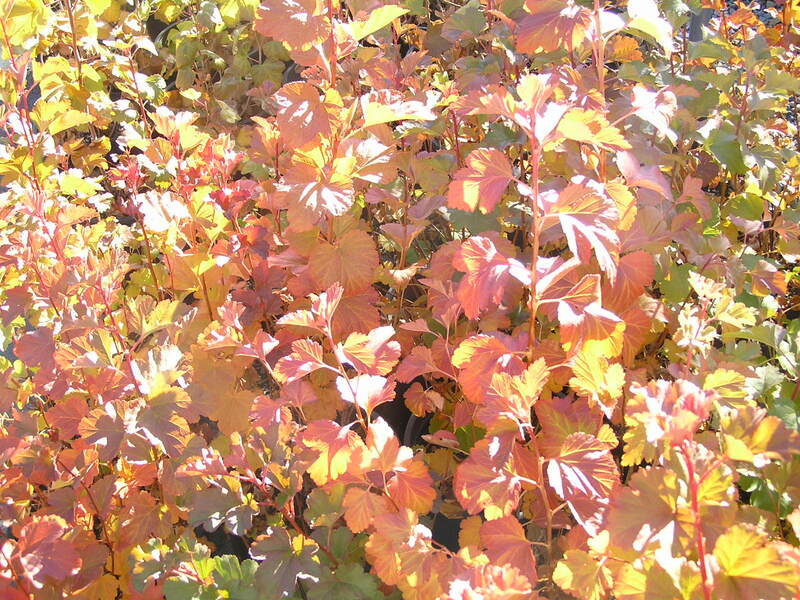 This is a large shrub to a small tree with glossy green leaves and yellow, orange red to red fall color. They are great for Quail, Squirrels, and other critters. This is a shrubby evergreen shrub or small tree with blue green holly like leaves. This shrub tolerates poor soils. Will lose its leaves during cold winters. This is small tree or large shrub with blue green wavy leaves. 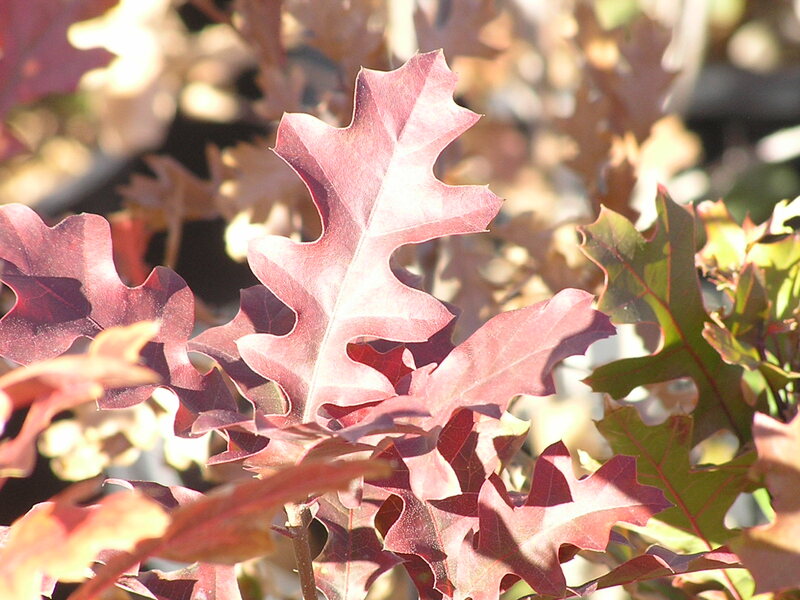 Similar to Gamble Oak, but holds onto its leaves till spring. This shrub has rigid upright branches with narrow deep glossy green leaves. It has green to white flowers in late spring followed by pea sized red to black fruit in summer. They have golden yellow fall color. This is a broad spreading shrub with sprawling branches and glossy green leaves. The leaves turn to shades of red, pink and yellow in fall. Small yellow flowers produce red spiked seed heads in mid-summer. This is an open rounded shrub often forming colonies from suckers. It has finely cut deep green leaves and bright red fruit in fall and great orange and red fall color. This is a large arching shrub with dark glossy green three lobed leaves. Small yellow flowers turn into bright red berries in mid summer. The berries taste like lemons and be used as lemon aid. The leaves turn to rich red to bright pink shades in the fall. It is great for fall color. This is a prostrate form of three leaf sumac. It forms a dense ground cover that will cascade over walls. This shrub has amber to brick red fall color. This is a small tree to large colonizing shrub. It has great red to orange fall color. This is a small tree to large shrub with bright green finely cut leaves and red seed heads in summer. They spread by suckers. They have excellent fall color. This is an upright shrub with glossy green leaves. They have fragrant yellow flowers in spring followed by fruit which can be orange to red to black. They have pale orange to red fall color. They are great for attracting birds. This is an upright shrub with waxy bark and glossy green leaves. They produce pinkish white flowers in spring followed by bright red fruit in summer. They tolerate dry shade well. 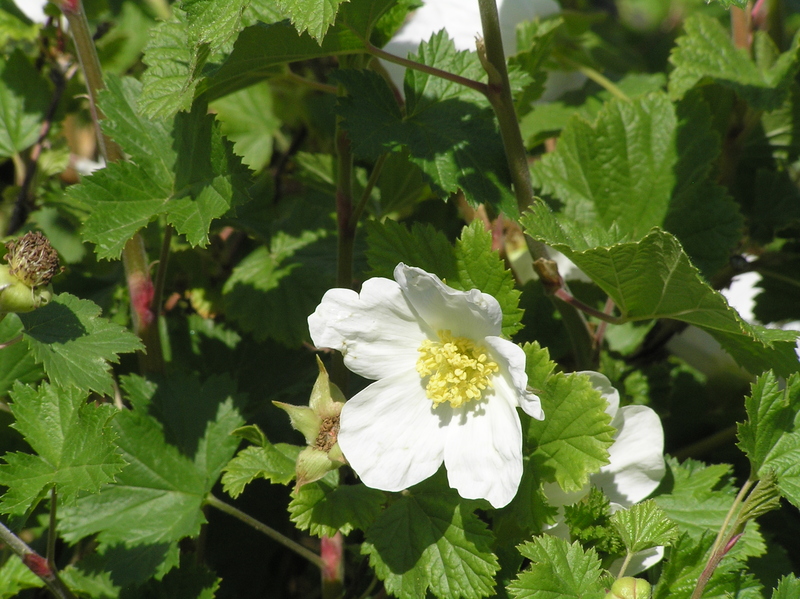 This is a spreading mounding shrub with white thorny branches and glossy green leaves. They have white flowers in spring and red sweet fruit. They make a good thicket. This is an upright shrub with fragrant yellow flowers that smell like cloves in spring and followed with delicious black fruit. The fruit makes a great jelly. This is a small thorny tree with pink flowers on drooping racemes. They are an attractive tree for small spaces. They tolerate saline soils and have a tendency to sucker. 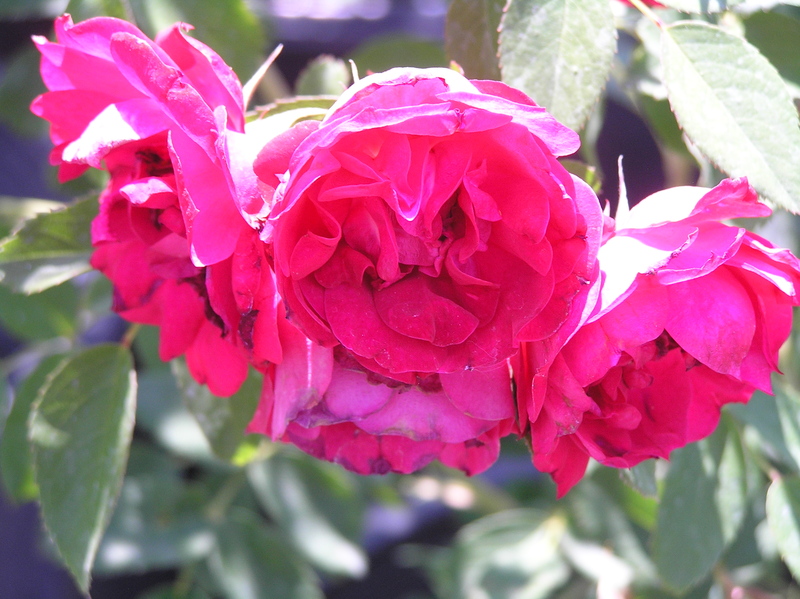 This is a fast growing shrub rose with clusters of red fragrant flowers all summer long. They are resistant to mildew. This is an upright medium sized shrub with large fragrant crimson flowers. This is a ground cover rose with dense dark green leaves and double white flowers. This rose works well as a ground cover. They have small pink flowers through summer. This is an arching climbing rose with pink flowers in late summer. This is a thicket forming shrub with thorny red twigs. They have fragrant pink flowers in summer followed by bright red rose hips in fall. The rose hips are high in vitamin C.
This is an arching shrub round lobed bright green leaves. They have white flowers in spring and followed by purple berries in summer. They tolerate dry shade well and are great for birds. This is a mound forming evergreen perennial with purple flowers in early summer. It works well in cactus gardens. 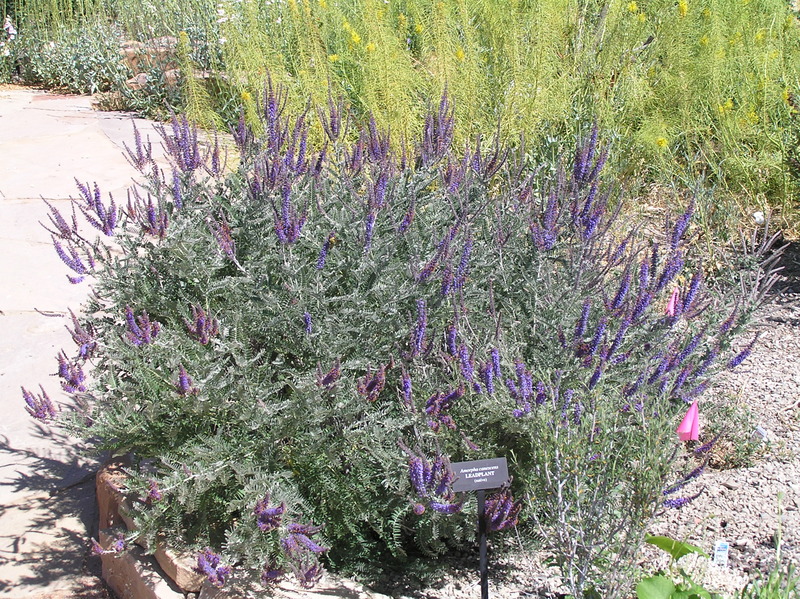 This is a low growing shrub with attractive silver blue leaves and purple stems in winter. They are also called Salix arenaria. This is a very well behaved willow, doesn’t get too wild. They grow shorter at higher elevations. 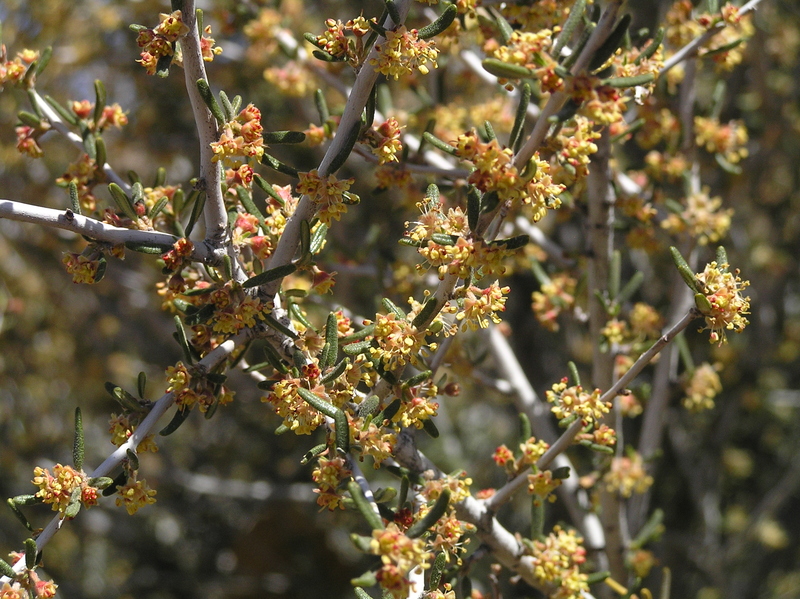 This is a tall shrub or small tree with bright silver leaves and small yellow flowers. The female shrubs produce bright glossy red berries. The tart berries make a good jelly. They will spread by suckers. This is a large shrub with attractive upright branches and compound dark green leaves. They produce large cream white flower spikes in late spring to early summer. They have reddish purple fall color. This mounding shrub has bright gold foliage in spring, then turns to yellow in summer and has bright pink flowers. They have very nice fall color. This is a low growing mounding shrub with clusters of reddish-pink flowers in late spring. They have purplish fall color. This is a rounded shrub with pink flowers in early summer and burgundy fall color. This is a compact shrub with dark green leaves and white flowers in spring. Nice yellow to orange fall color. They can tolerate sun to shade. 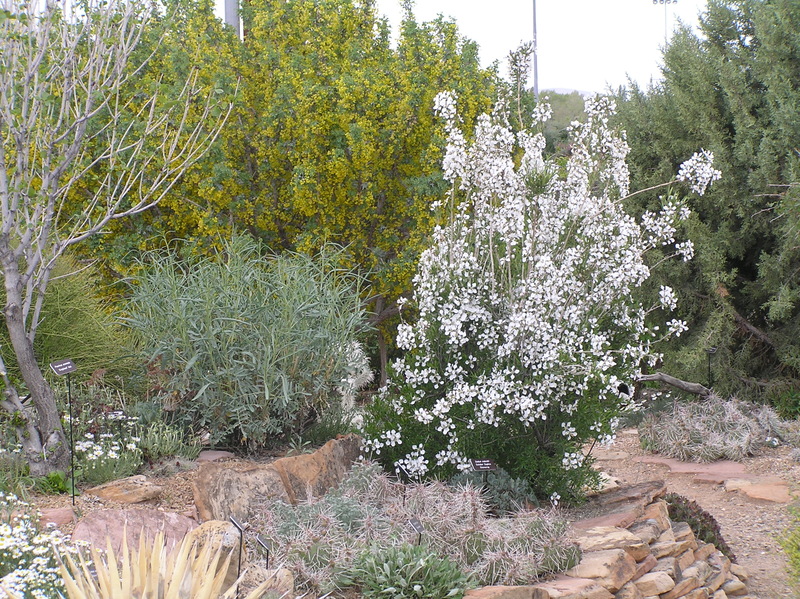 This is an arching rounded shrub with clusters of showy white flowers in spring. This is a large shrub with long arching branches and fragrant white flowers in spring. This is an arching shrub with blue to green leaves and pink to white flowers in spring followed by white berries. 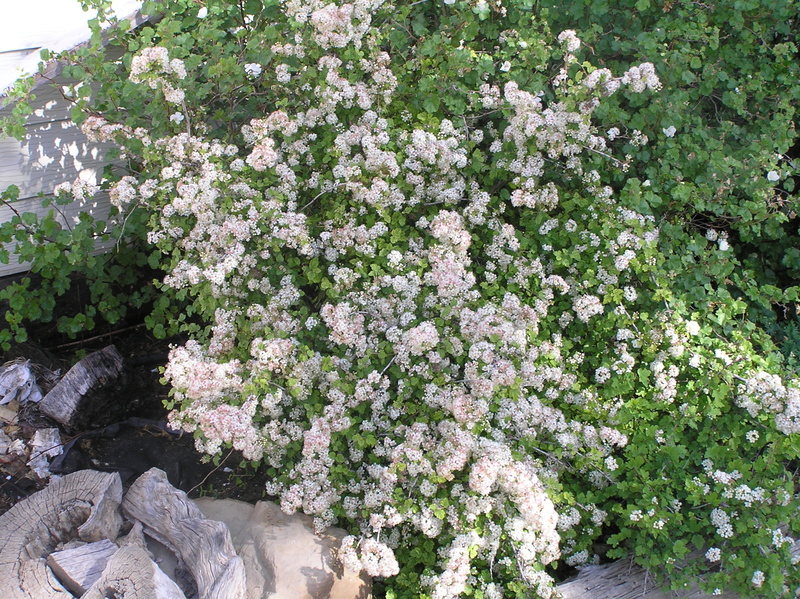 This is a low growing vase-like shrub with arching branches and small light pink flowers. They produce white berry like drupes in late summer. They tolerate sun to shade and poor soils. This is a rounded shrub compact with glossy dark green leaves and fragrant lavender flowers in spring. They make a good foundation or border plant. 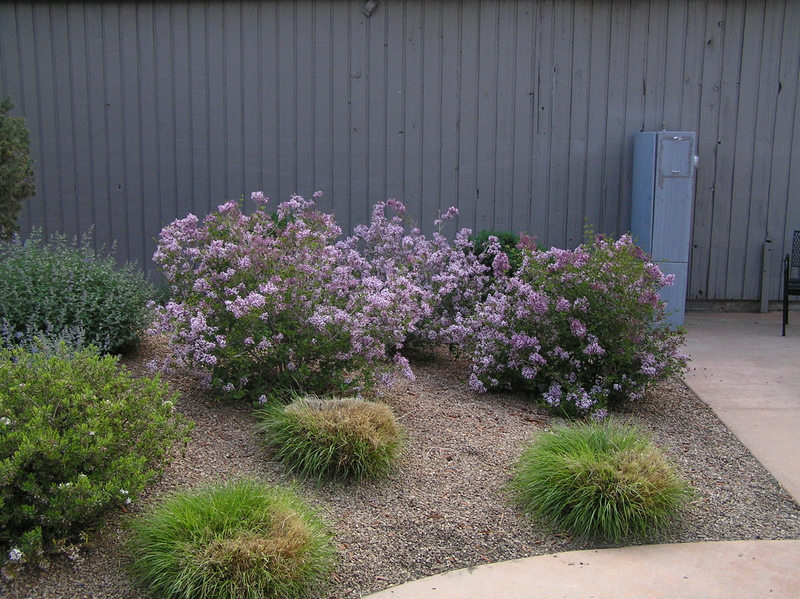 This is a rounded shrub with dark green foliage and pale lavender blue fragrant flowers. This is a tall rounded shrub with fragrant purple flowers in spring. It is often used for hedges. This is an evergreen shrub that can form a short woody stalk. They have long thin leave blades and white flowers in Spring. They very drought tolerant. This is an evergreen shrub with long twisting blue green leaves. The flower stalks 2-3′ tall with large green banana shaped fruits in late summer. The fruit tastes like banana too but watch out for the worm! This is an evergreen tree form Yucca with short spike like leaves. As with most tree form yuccas, it is very slow growing. This is a tall tree-like Yucca with large flower stalks and cream white flowers. This slow growing yucca is one of the hardiest of the tree form yuccas. This shrub has stiff sword like green leaves with 4′ tall flower stalks and greenish- white flowers. This is native to the eastern slope of Colorado. This is a clump forming shrub with curly spiky leaves and thin white threads creating a silver cloud. They are a native to the western slope of Colorado. They tolerate poor soils well. This is a tall tree forming yucca with long blue green leaves. They look much like a palm tree. Plant them in a well protected area. They are slow growing and native to the West Bend area of Texas, hardy to -20F. This is a fairly short yucca with blue green twisting leaves. 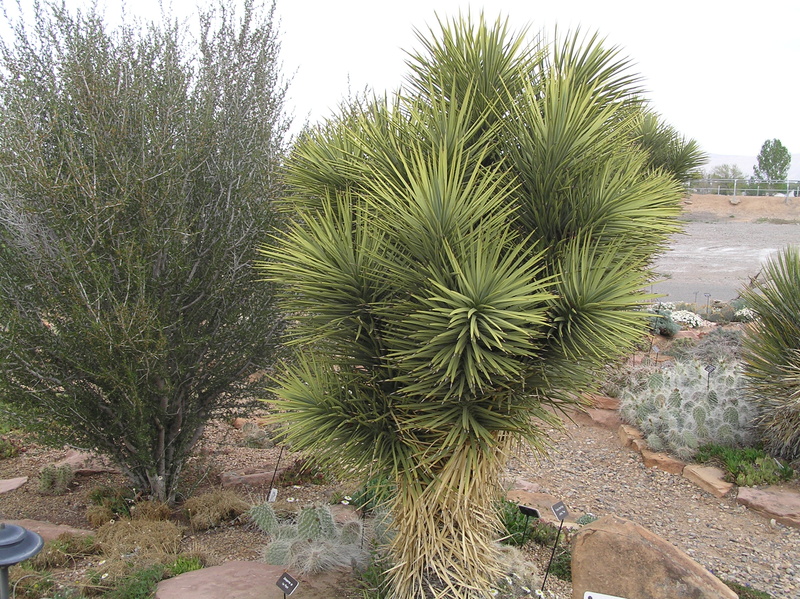 This is a low branching tree forming yucca with gray green leaves. They usually have multiple heads. This is a fairly short Yucca with wide blue green leaves.